Boys and there toys. What a way to spend Easter! Today was a great day in Kansas. The weather was phenomenal for an early spring day. We headed to spend time with the Queens family. My Father-in-law had mentioned he needed help with finding some property pins. I hunted for them for about an hour and couldn’t find them. We followed that with a great meal and an easter egg hunt. After dinner we went flying… Kinda! My flight ended with the Firebird Stratos going into a tree. Not a big deal when you are a climber. 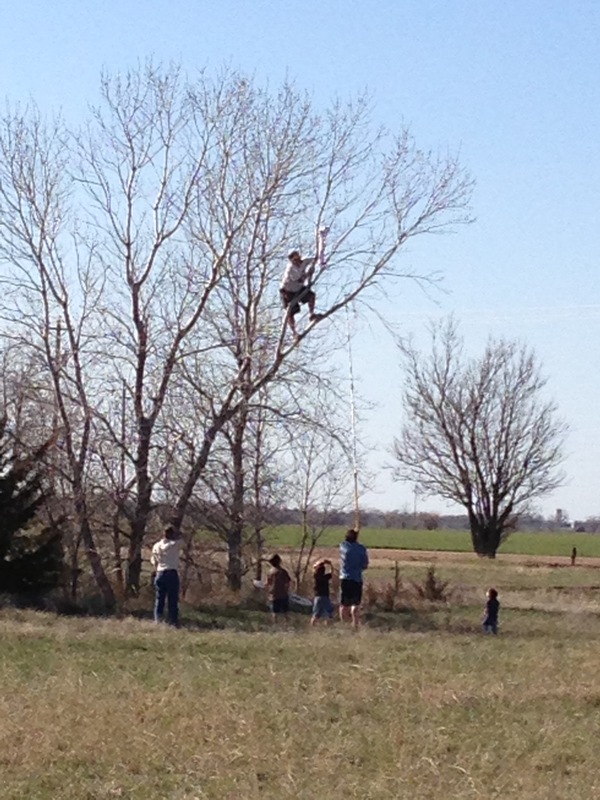 I heard a few spectators speaking out about me not climbing the tree. I was right at home though! The plane was recovered without damage. 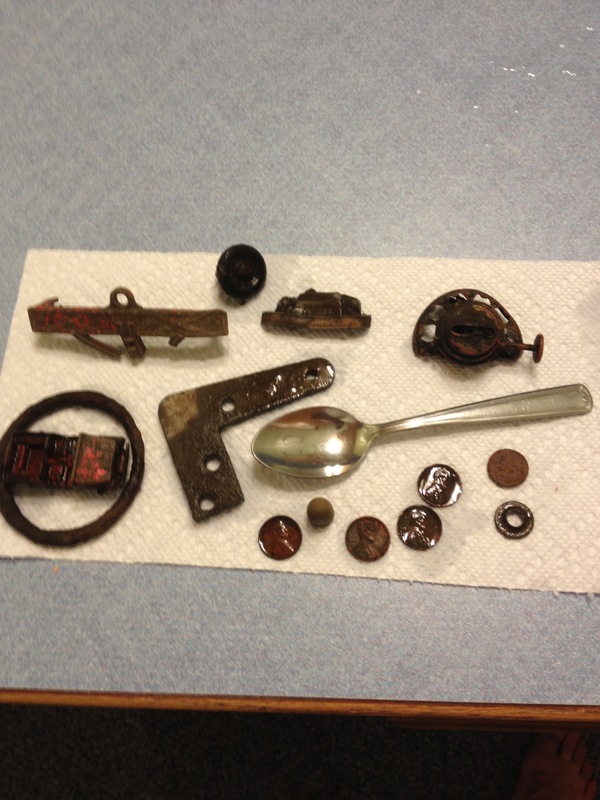 After returning home I went detecting at an old homesite that I had been wanting to hunt. I ended up digging some cool stuff but no wheats, indians, or silvers. Not sure where they were, but I didn’t find them! All in all it was a great day to be outdoors with family and friends. It’s all so foreign to me..
Tonight I went over to the local sports fields. It was dusk, 35 degrees, and the wind was blowing. I decided to hunt under a metal soccer goal that isn’t being used this spring. I see kids climbing this particular goal all the time. I quickly found a couple of memorial cents and several pulltabs. I then got a decent signal at 4 inches. I dug my plug and flipped it over. I realized I was looking for multiple targets because my propointer detected something in the plug as well as the sidewall of the hole. I turned on my energizer headlamp to find the first target. I found a coin rim and gently pulled it out. I could tell it was a foreign coin but I couldn’t clearly see the markings due to the thick clay soil. I put the first target in my back pocket. I then focused on target #2. 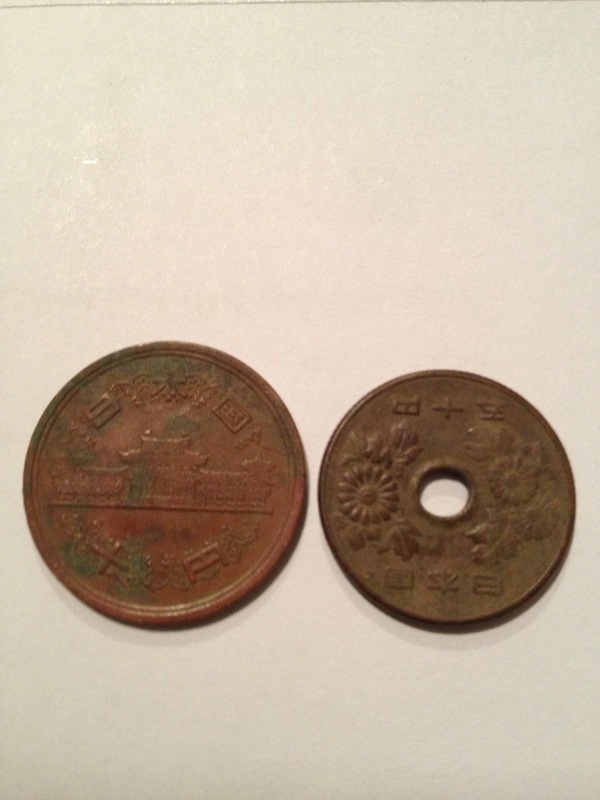 I found it and could tell it was a foreign coin as well. I couldn’t see any details on it either. I slid it in my back pocket and continued. I stayed out for almost an hour and found some clad. I then headed home to clean and show off my neat items. I realized that one of my foreign coins was gone. I knew immediately what had happened. I was wearing bulky gloves that had kept the coin from actually making it in the “pock”. I explained to queen Ukena that I needed to go back and find it. I had remembered the exact location that I had recovered it. When I got back there I grabbed the Propointer and swept about a 5’x5′ area and sure enough the recovered coin was recovered again. I can’t express how helpful the Propointer is. It has totally changed how quickly a target is recovered. I would be lost without it. 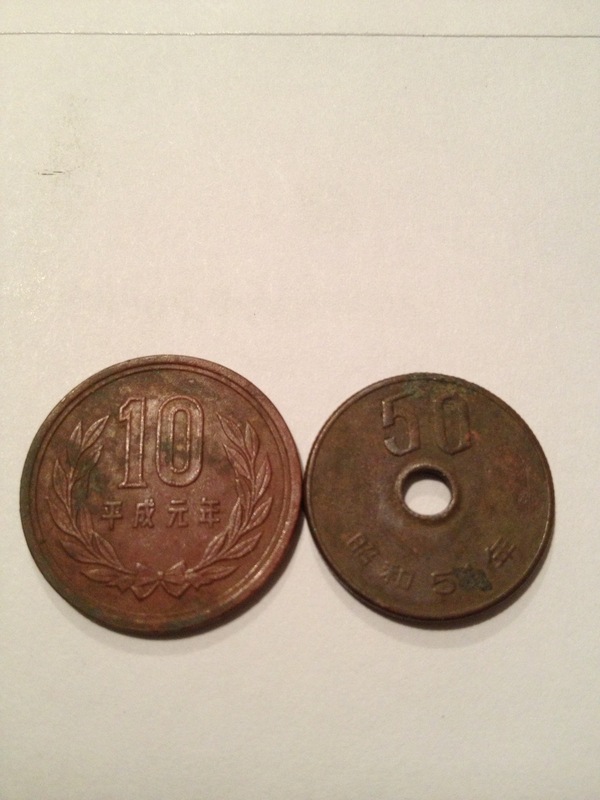 When I returned home I cleaned up the coins to find oriental writing on them. a quick google search shows me they are 10 and 50 yen. If my eyes and research are right they are from the mid 1960’s. they do have a strange way of calculating age though. It goes by dynasty and then number of years the dynasty has reigned. it’s kind of hard not knowing what all the symbols mean. I can’t explain the increase in foreign coins found this year but I have already found more than last year. This afternoon I got a call from a fellow metal detectorist. He wanted to know if I would like to join him for an after work hunt. The weather was great so I agreed. We met at the large site many guys have been hunting in town. I ended up being there for two hours. I started slowly in an area by myself. I then decided to meet up with my buddy. He had found a couple of wheats. I quickly continued the wheat trend. The Garrett was talking to me. I was hearing the subtlety of it’s tones. I swung my coil over a target and told my friend that it sounded like silver at 6 inches. He swings a Garrett ATPro which provides VDI numbers. The numbers were bouncing between 85 and 91. I decided to dig and was blessed with my 11th silver of the year. It is a 1961 Roosevelt dime. The coolest find of the night was my buddies tootsie toy find. I am trying to con him into trading it for a couple silver coins. We shall see. I’m glad we got out this evening before another little snow storm hits us this weekend. Well this morning started out early. I had quite a bit of painting that still needed done. I didn’t have any volunteers to climb the scaffolding and ladders necessary to reach the areas that needed painting. It took me about an hour to tape everything while constantly moving my jungle gym around to reach things. I don’t usually complain about being 5’4 but it would be handy to be a little taller during this painting session. Anyways I spent right at 6 hours painting. We then had to make a trip to The hardware store to get some supplies. When we finished both Ukena boys wanted to get out and do something. 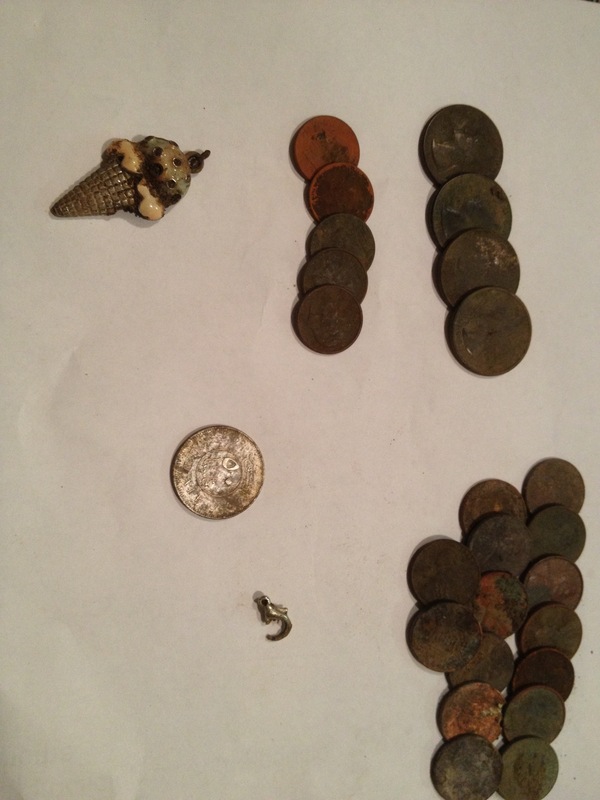 I returned to a site that I have hunted a couple times that has produced silver coins, jewelry, and many wheats. This site also has many acres of empty land to play. The boys quickly found an area of sand that formerly had a playground. They also found some building materials that was left behind. Needless to say this kept them entertained while I detected for a couple hours. We decided to stop and get some dinner. They then wanted to play some more. We quickly found an older elementary school that offered both detecting and playgrounds that were quite impressive. We ended up detecting for another hour and a half. The only interesting find of the day was a coin from Kuwait that is a little smaller than a quarter. I don’t know much about foreign currency and this one isn’t much help as Kuwait is all I can read. During our time outdoors today I noticed something about my boys. If you remove video games, movies, and other distractions from their reach they actually play and have fun without argument. Many times I would stop detecting and just watch these two having a ball. It’s the simple things in life that make me happy! Tomorrow we may have to see if the bass are biting.. If we get our work done that is..
Steve spent a saturday in silver city with his sons.. What did Steve find? Today marked the first day of Spring break for the Ukena kiddos. The day started early when Queen Ukena left with two kiddos for Minnesota to visit family. The two oldest Ukena boys and I planned out our day. We started by setting a goal. We wanted to hit the 200 found geocache mark. This meant we needed to find 6 caches today. We started with a few close to home. We then returned home for some lunch. After doing some household chores we headed to Silver City. Silver City is a large site that has produced many silver coins. I met up with another area hunter and we started in an area that has produced in the past. 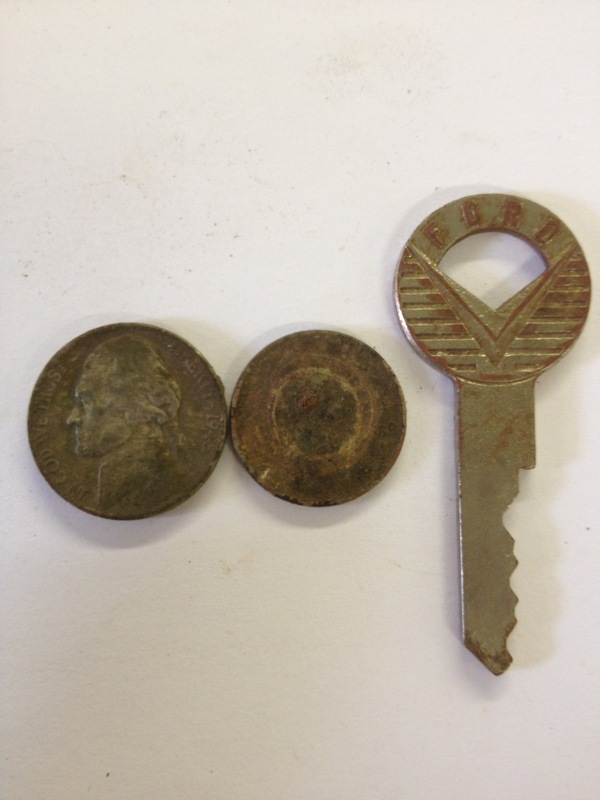 We both quickly found a wheat penny or two. In the end we pulled 5 wheats but no silver. The boys and I then headed to Stearman Field to enjoy dinner and the Big 12 championship game. Needless to say it was a great day outdoors and with the boys. They should not have any trouble sleeping tonight! Well as I mentioned in Ravenous and Germy I purchased a new Rav 4. I bought it at the beginning of January. I’m sad to say that since then I hadn’t even started my motorcycle let alone ride it to work and back. This is partially due to the Rav being new and exciting. I have also loved the convenience of not having to break my detector down every time I go detecting. For those who know me they understand that this is the longest my bike has sat in its small portion of the garage. After 5 years of commuting on the motorcycle Nearly everyday, the break was needed. I got burnt out on riding it. This morning the thermometer was sitting on 37 degrees and the sun peaking over the horizon. I climbed aboard my little Vstar and away we went. As soon as I left my cul-de-sac and rolled on the throttle a flood of emotions came back. Between the feeling of a v twins vibration and the lean of two wheels I remembered why I loved motorcycling. I was ecstatic! I sent my wife a text message when I got to work sharing the feelings I had with her. I may have related it to mammals fornicating the same way everyday for 5 years. Yes, I am a man and I see the direct correlation in my mind. Eventually it would get dull even if it was the most exciting thing they had experienced in the beginning. Now then, after getting all the kids to bed I went night hunting. Since it was 9:30 pm I stayed close to home and went jewelry hunting at some local sports fields. No jewelry found but I did find some clad and relaxation on a great 50 degree night! Happy hunting and be safe out there! Tonight I want to write about the happenings of Sunday and Monday. Sunday morning I woke up excited to go metal detecting. I called a few compadres but nobody took me up on my offer.. Why, I guess it had to do with it being 35 degrees, 30 mph winds, and spitting moisture slightly. Since it was just me and the weather sucked, I decided to stay close to home. 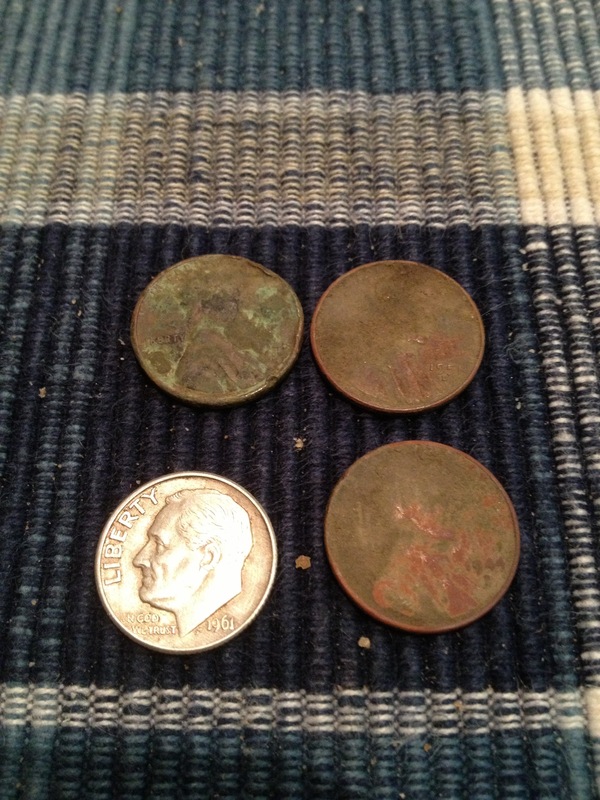 I hunted an old school site that we have found many wheats and some silvers at. This is a school yard that has been used since 1911. I know other detectorists have hit it over the years but I’m certain there is more to be had. If you are slow, patient, and persistent there are goodies. I quickly dug 4 clad quarters which is unusual for me. The only notable find for me was a 1946 wheat cent. Tonight after work I loaded the Ukena boys up and we were to go flying. We got to the field and my new plane wasn’t responding to my transmitter! I tried rebinding it as well as removing and replacing the battery. Nothing at all happened. I quickly came to the conclusion that we needed to recharge the battery. We quickly headed home and put the battery on the charger. After about 30 minutes later we headed back to the field. We flew the plane on 3 different flights and all three were successful. These were my first successful flights including landings. I have to say I owe it to my Iphone. I have been playing a simulation game called Absolute RC plane simulator. It helps tremendously! No matter which hobby you enjoy; practice and it will pay off! Well today was not a detecting day, it was however an exciting day for the eldest Ukena boy. 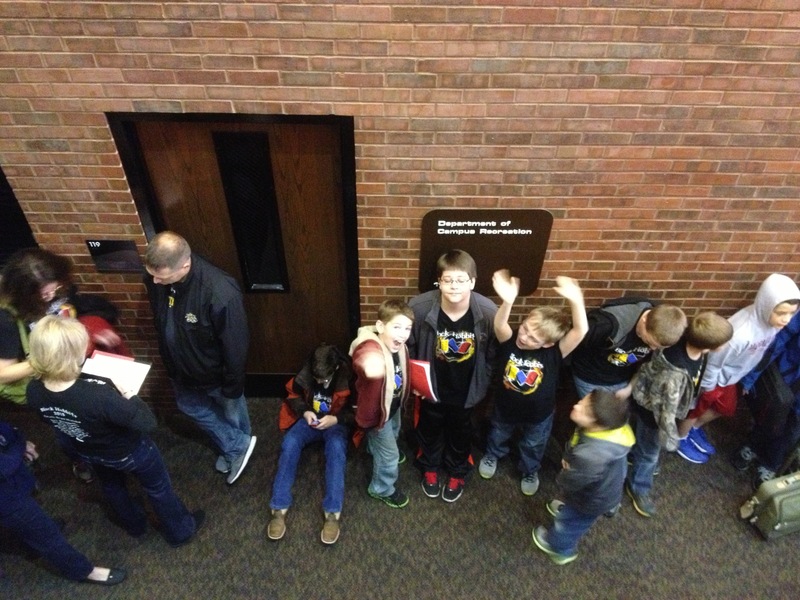 We attended the WSU mindstorms competition. Kolton and a team of 8 other boys have been building, testing, and rebuilding bots for the last few weeks in preparation for today. There were 31 teams from beginner to advanced levels. 16 of those teams were beginners. You can see and read more about the challenge here. They had a great time and the robots did quite well. 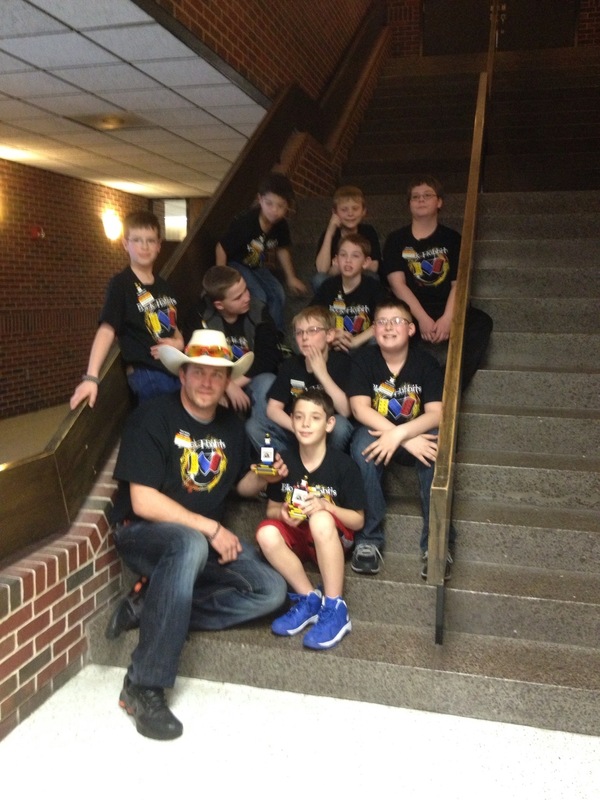 They finished up the day with a first place lego trophy in spirit and sportsmanship. They also took 2nd overall in the beginner division. It was nice to see their hard work pay off! It rained all day so detecting and flying were not in the cards. Tomorrow is a different story. I plan on getting out to detect for a few hours and hopefully fly for a bit. I took the bird out for the first time the other night and lets just say I had a hang up including tree limbs. A very quick rebuild and we are ready for round two! Lego building, detecting, and flying oh my! Just in the “nick” of time! Well today over lunch I headed back to the site I discussed in yesterdays post. My time there started slowly but the picked up. 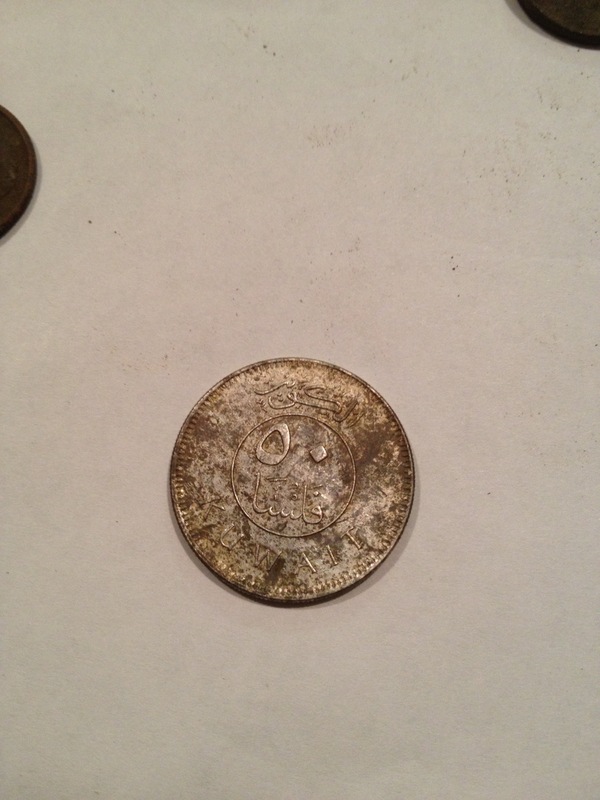 I had dug only a few clad coins and then I dug a wheat penny (#7 from the site). 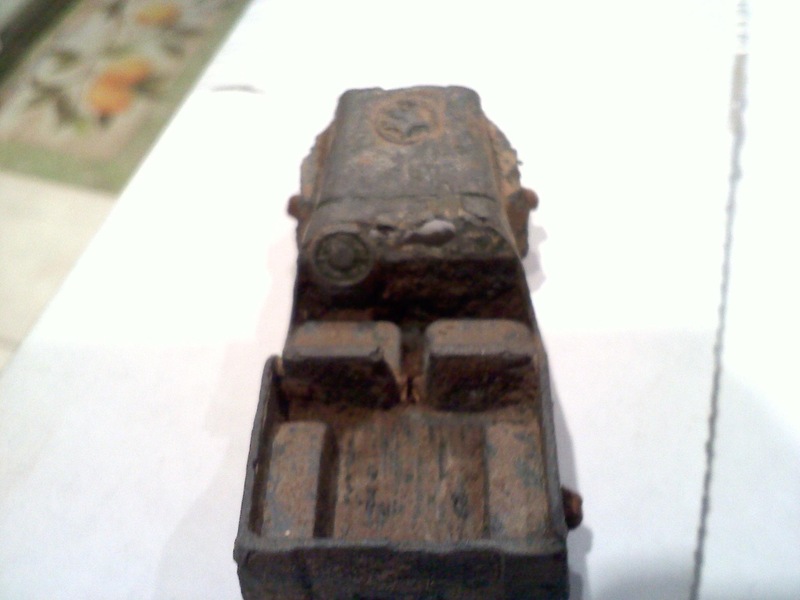 I dug an old Ford key that was kind of cool. As I swung my Ace gave me a unfamiliar tone. It was a scratchy high tone with mixed mids. I dug this signal in hopes of finding a silver ring because they give up a similar sound based on the size of ring. I quickly realized that my target was in my plug and I could see an impression of a circular object. I was pleased to see a shiny coin looking at me. The first silver from the site came via a 1945 D war nickel. There are a few people who were ready to throw in the towel on this site. Not me! I returned after work with another area hunter and he found a 54 Roosevelt dime. Hopefully the trend continues!